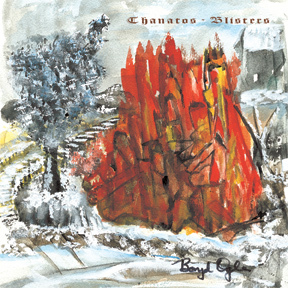 Diving into the contemporary music ocean on Blisters, Padraic Ogl and guitarist/instrumentalist William Tucker (Chris Connelly Band, Pigface and Foetus) expand Thanatos’ acoustic / darkwave sound with sample-rich textures and rhythmic drum patterns. In their previous incarnations, Thanatos’ main focus was rhythm guitar and vocals. While retaining these elements, the addition of Tucker enhances the band’s sound considerably. Tracks such as “Splinters” and “A World with Tigers” are positively dance friendly; while “No Longer at Ease” and “Watching the River Freeze” remain true to the band’s roots. Lyrically, the songs have moved from politics and history into more cryptic, philosophical terrain. Guest appearances from Arcanta’s Brother Tom and co-founder Sam Rosenthal round out this release.